We took these photos much earlier than has been usual this summer because a fire has made the sky unusually hazy. We figured it was a case of now-or-never for photos, since the further the sun was sinking the pinker/oranger the light. Rather a relief not to have to wait till eight or eight thirty, and we go back in time to put some steaks on the grill and enjoy eating outdoors. What you see above is my very first attempt at a beehive hairdo! It was, um a liiittle messy. Still looked neat (no pun intended), but messy. Hence the headscarf. As for the outfit itself, quite a bit came to me from other people. This fun shirt is actually my sister's, who is moving soon, so its likely the only appearance it will make on this blog. Not only is it hers, but she got it while studying abroad; they are unlikely to sell these kind of shirts around my neck of the woods. Too unusual. The shoes were won in a giveaway, and necklace was given to me, along with a whole box of other costume jewelry, by a co-worker one day. I don't usually wear costume jewelry that much, but talk about generous. And this necklace is rather fun and vintage-y, isn't it? Sometimes infusing your wardrobe with another's tastes can really bring out the unexpected in your style, I think. I love all the touches of yellow in your outfit! What book is that if you dont mind me asking? It says its the Wizard of Oz (I am a HUGE Oz fan), but it is actually a blank book. On the side it says it is an ideabook for a wizard's thoughts, plans etc. Cute! Love the headband and your flats. Love the outfit and loving the hair! Great outfit, the location matches perfectly!! Hope you're doing fabulously!! Come swing by to enter my Alainn Bella giveaway!! beautiful post, love the top! love the farm road and the smoke haze sky! Such cute shoes!! 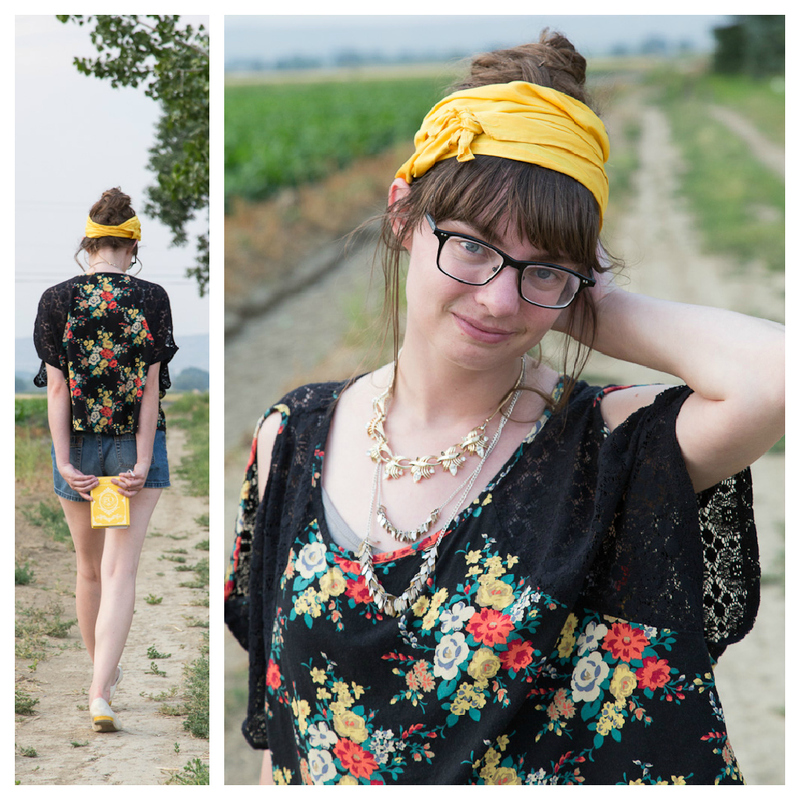 Love the yellow accents in your outfit too! I really love this outfit, with all the beautiful colors. I especially love the top!